I know I usually wait until Saturday to post, but I'm off anyway, so I figured I'd post the sketch early. So first, here's the sketch. As always, feel free to use it as a starting point. You can change things to suit your design. I based this sketch off of a card I made earlier this week. However, I enjoyed it so much that I made a second design. A few dimensions for you, the background panel is about 3.5x4. The "flower" is about 2 inches in diameter. As you can see I pretty much copied my card design to make the sketch. I had a flower, leaves, and a button on the original card. I also had the sentiment tag placed just so. You'll see in my second card what I mean when I say to change things so they fit your design. Here's the original card. It was posted on my personal blog earlier this week. 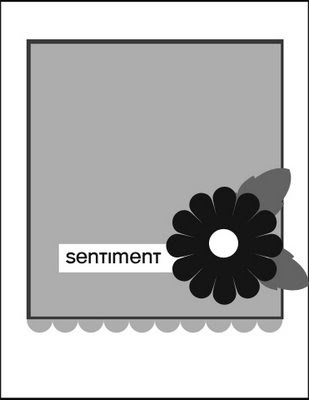 I had a lot of fun piecing together my own flower with die-cuts, instead of stamping and cutting out a floral image. For the second card I did something that I've been wanting to do forever, but for some reason the execution of it just never occurred to me. I love polka dot backgrounds, but I've been wanting multi-coloured dot backgrounds. I was checking out some new-to-me blogs, and came across Laura's, this post in particular, was kind of an "oh yeah" moment. 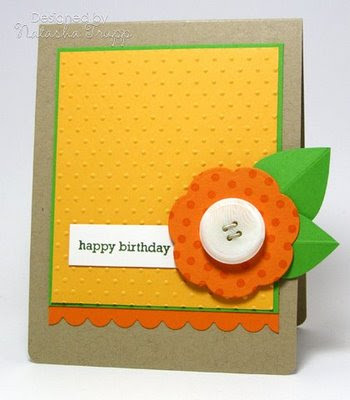 Use the outline polka dot backgrounds and just stamp in your own colour. I suppose if you really didn't want the colour to show you could stamp in versamark and just use it as a guide. I was okay with the outline showing here. With all the fun spring stuff around (and we're finally getting weather forecasts into the double digits! 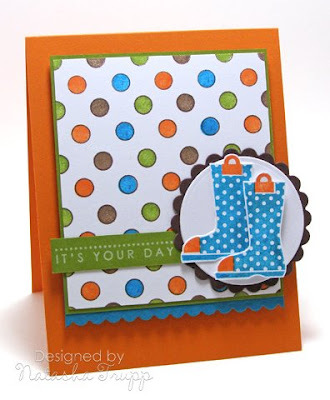 ), I decided to pair the dotty background with a few garden boots. I really love these boots. I modified the sketch ever so slightly. Instead of a flower and leaves, I used a scalloped circle. And because my sentiment was too long, I had it flow over the edge of the background piece, since it wouldn't look right hugged up to the edge of the mat. Great sketch, and I'm diggin' the polka dotted goodness! How darling! I love that flower. Great work. Another fabulous sketch - I can't wait to try it. And super sample cards - so fresh and springlike! TFS! Just love your work. I just found your blog and I'm looking forward to see more of your stuff!